Listen as Rod Ohnick portrays M.W. 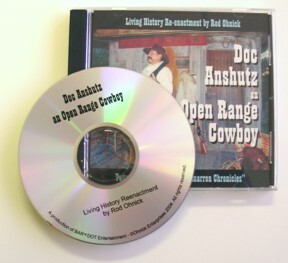 (Doc) Anshutz with stories taken from the pages of Cimarron Chronicles, a book written by Doc and his wife, Carrie, about their adventures on the open range in the mid to late 1800's. Enjoy this living history re-enactment of a common cowboy who lived a most remarkable life on the wide open prairies of Kansas and the Oklahoma Panhandle.